I just finished watching a Michael Hosaluk DVD I really liked. “The Art of Hosaluk in Woodturning” by Michael Hosaluk. At $60 the 2 DVD set is not cheap. But, I think it is reasonable because it is a 2 DVD set. Each DVD is 3.5 hours. Twice as long as most DVDs. So it is more like 4 DVDs for $15 each. Available from Michael or Packard (packardwoodworks.com). 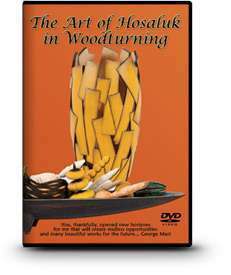 The first DVD shows how to make (turn, band saw, carve, wood burn, paint, etc) well known Hosaluk projects from his demos and classes. A spin top, a base ball, offset turning, strange fruit, tea pot, footed bowl, and candle sticks. There is lots of good detail. At the end you feel like you can make each of these projects, no problem. The chapter on offset turning is one of the best I have seen. Michael and the overhead camera angle, make it look so easy and predictable. The chapters on tea pot and candlesticks were very interesting. I have often struggled with how to band saw strange shapes safely and how to drill perpendicular holes in round shapes. Michael showed some great, easy and cheap tips that are definitely being added to my arsenal. I didn’t think, Michael could teach me anything about bowls. I was wrong! He showed how to easily cut feet into the bottom of a bowl with a Japanese saw. The second DVD is covers making a sea form box, good form, surface enhancement, design ideas, painting, tools and photo gallery. The Sea Form Box chapter is very interesting with lots of good tips. Good and simple demo of how to use a hook tool. Lots of band saw and glue up tips. I of course loved the chapter on Painting because I love lots of color. All of my acrylic painted stuff uses the techniques I learned in a class with Michael. The images in Photo Gallery were stunning. There are lots of other examples of Michael’s work scatter thru out the DVDs. With a good discussion of them in Surface Enhancement and Design Ideas chapters. In the DVDs Michael explains how to use his double beveled detail gouge, roughing gouge, and a hook tool. He also uses a spindle gouge and skew in a few places. The pace of the DVDs is good. Not to fast and not to slow. Michael “gets to the point” but there is no need to rush when each DVD is 3.5 hours. The shooting angles in the DVDs are very good. Good overhead shots show how Michael is using the tools. Cutting angles, etc. I found the same to be true about Mike’s DVDs. I have purchased other DVDs that I can honestly say that were NOT worth the $$. This set is far above average and I have found that I can refer back to it and learn more / recall the info each time. I also took a 3 day class with him and found him to be a good teacher / instructor, adding humor into his teachings. As with many turners who produce a video and do classes, they two are quite similar.